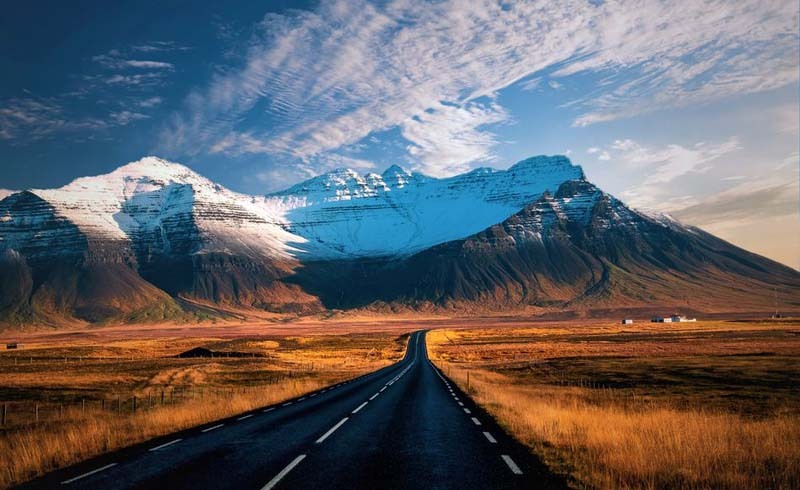 As if Iceland couldn't get any better, with it's majestic (and sometimes) volcanic mountain peaks and lava rock fields dotted with hot springs, it also offers one of the best road trip routes in Scandinavia. If you're looking to take some real time to experience all corners of the island, the Ring Road is a perfect vacation itinerary. Iceland's Ring Road circles the perimeter of the country and it's easy to pick up no matter where you are. All in all, it measures around 828 miles and will take you about a week to complete — and that's without any lengthy stops. There are plenty of side roads that will help you get off the beaten path and away from the road-tripping crowds. But the reality is, you could drive for hours without spotting another human. And that is a truly wonderful thing. Ahead, we break down everything you need to know about planning your own trip around the Ring Road. There are a couple of ways to tackle this route: you can drive the entire thing around the country or you can take on specific parts of it. 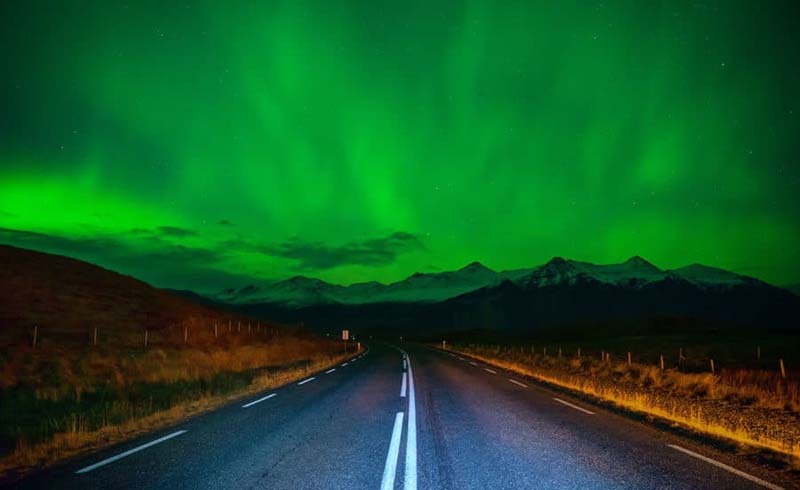 There is a lot to see along all sections of this route, so doubling back will be anything but boring if you decide to, say, drive from Reykjavik to the Glacier Lagoon and back in a long weekend. Route 1 is almost entirely paved, so expect a pretty easy drive. But keep an eye out for passing sheep and horses — you never know when the local wildlife will make an appearance. If you're not looking to make too many stops — just to sleep and grab some food with a few quick breaks to ogle the nature you're passing by — you can do this trip in a week. If you really want to do it right, plan a 10-day drive. It also depends on what time of year you're planning your Ring Road vacation. While it certainly can be done during the winter, you will have to deal with impromptu road closures and bad winter weather. It's not uncommon for stretches of road to shut down for days after a big snowstorm; news like that can completely derail a trip. You will need to plan more time for winter drives along the Ring Road than you will with summer drives. With that in mind, seriously consider taking your road trip in the summertime. Not only are the days longer — there's near-24-hour sunlight in late June and July — but you will also save some money on rental car insurance. You can really make this trip as long as you want to. There's plenty to see and do to supplement a month-long trip, should you have the time. Most major cities are located off of the Ring Road, but some of the most charming villages and people are a bit off the beaten tourist path. Hypothetically, if you were planning on driving straight through without any stops, you could drive the entire Ring Road in 16 hours. But where's the fun in that? Reykjadalur Valley: This is a valley that's home to a hot spring river. It's a bit of a hike to get there — about one hour each way — but the remote views are worth it ten times over. Seljavallalaug: Chances are, you've seen this hot spring in a movie or on Instagram. Between Seljalandsfoss and Skogafoss (more on those next), you'll find this public pool. Follow signs for Seljadalur to find the parking lot. From there, it's a 20-minute walk into the mountain valley. Seljalandsfoss: This waterfall is known for the massive cave behind it, making it possible to walk behind the falls for a different viewing angle. Seljalandsfoss will take you about two hours to reach from Reykjavik. Skogafoss: If you're heading away from Reykjavik, you'll catch this waterfall after Seljalandsfoss. If you've got the time and you're looking to hike, this is the starting point for a one-day hike that will take you to Eyjafjallajökull. Black Sand Beach Airplane Ruins: Justin Bieber made a music video around it, photographers can't get enough of it — the DC Plane Wreck has become one of Iceland's most popular sites. There are signs pointing out a parking lot located on the southern stretch of the Ring Road, but note that you've got about an hour walk ahead of you before you reach the wreckage. This is one of those stops to take if you've added extra time for impromptu adventures. Reynisfjara: Located near the coastal city of Vík, Reynisfjara is the most famous stretch of black sand in Iceland. Here, you can get a close look at a basalt column cave. This is a stop that requires a bit of planning. The tide and wave patterns can be unpredictable, and have been known to take a number of lives each year. Check out our complete guide to the black sand beaches before nailing down your itinerary. Skaftafell: This area used to be its own national park, but it's now a section of Vatnajokull National Park. Plan an entire afternoon for this destination. Visit the Black Waterfall (Svartifoss), take an ice cave tour during the wintertime, climb Hvannadalshnjúkur (Iceland's highest peak), or take a glacier hike... with an experienced guide, of course. For more ideas on what to do in Skaftafell, check out this guide. Hofskirkja: Architecture enthusiasts should certainly plan a stop at this turf church. It's the last church (that we know of) that was built using a turf home style. What that means: There's actual moss and dirt covering the roof of the building, giving it the unique ability to seamlessly blend with its environment. Oh, and preserve heat for those horribly cold winter months. Jokulsarlon and Diamond Beach: You can't see one without checking out the other! The Glacier Lagoon, or Jokulsarlon, is a fantastic viewing spot for the ice calving off of Vatnajokull. Across the street, you'll find a black sand beach where smaller bits of ice wash up on the shore. Try to catch this scene during a sunrise or sunset for the best views. Snaefellsnes: Snaefellsnes Peninsula is a geological haven, full of volcano craters, a massive glacier, lava tube systems, and stunning cliffsides. Take a slight detour off of the Ring Road and head into the Snaefellsnes National Park. You can explore the whole thing in a matter of hours. Don't miss Budirkirkja — a lone church painted black with an expansive mountain range as a background. Westfjords: If you're thinking about camping, and you're visiting during the summertime, considering setting aside a few days in the Westfjords. It is a bit of a detour off of the main Ring Road, but the remote villages, cliffs, fjords, and red beach make it completely worth it. Secret Lagoon: This public hot spring is worth a quick detour off of the Ring Road. Located in Fludir, you'll find one of the oldest spots where kids learned how to swim way back when. This is thought to be one of the oldest standing hot springs in the country. Hraunfossar & Barnafoss: Thirty-five minutes off of the Ring Road, you'll find this set of waterfalls. Hraunfossar and Barnafoss send water down from underneath a lava field, making them just a little different from the other powerhouses you'll see along the south. Esjan: You'll be able to see this mountain from Reykjavik on a clear day, as it's just across the harbor. If you're looking a quick hike, you found it: You can get up and down this mountain about two hours — just enough time to shake a long road trip out of your muscles. Reykjavik: You can't visit Iceland without spending a little time in Reykjavik — give yourself a full long weekend to truly appreciate all it has to offer. After spending a week (or two!) driving the more remote regions of the country, transition back to reality at one of Reykjavik's many outstanding restaurants or bars. You won't find better nightlife anywhere else in the country, either. Make sure to visit the city's church, Halgrimmskirja. If you visit on the weekend, you may get lucky and hear the chorus practicing. Lake Mývatn: If "hot springs" make an appearance even once on your must-do list, head to Mývatn. This lake is surrounded in hot springs, as well as caves. If you're looking for a more luxe experience, check the Mývatn Nature Baths. Grjótagjá: Let's be clear here: You can't swim in the water at this hot spring. But if you're a fan of "Game of Thrones," you will recognize this location as the spot where Jon Snow and Ygritte, um, get to know each other away from the distraction of others. Dettifoss: If you head a bit off of the Ring Road, you'll find Europe's most powerful waterfall. There are two places to park, if you're looking to check out Dettifoss: on the east side off of Road 864 or along the west side off of Road 862. Check out our complete guide to Dettifoss here. Húsavík: If you want to see whales while you're in Iceland, head to Húsavík. This small town is about a 40-minute drive from Lake Mývatn and you'll have your choice of whale watching tours to join. Set aside an afternoon to really experience all this town has to offer. Akureyri: Speaking of towns, you can't drive through north Iceland without paying a visit to Akureyi, also known as the "Capital of the North." As Iceland's second-largest city, there's a bit of nightlife, plenty of restaurants, and a ski resort. Oh, and it's located in a stunning fjord region. Godafoss: Otherwise known as "Waterfall of the Gods," Godafoss is located right off of the Ring Road on the way to Akureyi from Lake Mývatn. Legend has it, the country's statues of Norse Gods were tossed into the falls after it was decided that they would accept Christianity as the national religion. Höfn: Head an hour north of the Glacier Lagoon and you'll run into this fishing town. It's the kind of scene Scandinavian daydreams are made of. It's a great place to stop for a few days to take in the local hikes and museums. Hallormsstaðaskógur: It won't take you long to realize that Iceland is pretty devoid of forests, but you will find the largest collection of trees in east Iceland. Hallormsstaðaskógur also marks the halfway point on the trip, being around eight hours from Reykjavik. Vestrahorn Mountain: Known as "Swan Fjord," you'll find — you guessed it — flocks of swan congregating near this mountain during the summer. Its rigid peaks make it a destination for many photographers. Hengifoss: If you want to stretch your legs, pencil in a visit to the waterfall. It's about a two-hour hike from the parking lot, but it's worth the trouble: Hengifoss is surrounded by basaltic strata and stripes of red clay. You won't find another waterfall like this in Iceland. Airbnb is always a good choice when you're visiting different parts of the country and there are plenty of options right off of the Ring Road in Iceland. You will find lodging ranging from guest houses to luxe multiple-star hotels on your journey. Some of the best hotels along the Ring Road — or a slight drive away — are the Fosshotel Glacier Lagoon, Five Million Star Hotel, Hótel Laxá, Hotel Budir, and Hotel Ranga. There are certainly more options than that, which can be found by searching the towns near where you'll be driving.